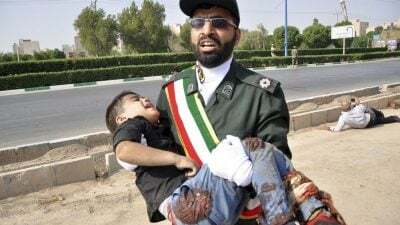 On Saturday, a terrorist attack at a military parade in Ahvaz, Iran killed at least 29 individuals, around five dozen others injured, many seriously, military personnel and innocent civilians targeted. Mostly civilians were harmed, including women and children, the death toll likely to rise. The terrorist attack was reportedly carried out from outside the parade perimeter – from a park overlooking the observation platform. According to Islamic Revolutionary Guard Corps (IRGC) spokesman General Abolfazl Shekarchi, four terrorists were involved in the incident, affiliated with the anti-Iranian (Arab separatist) Al-Ahwaz group, three killed, the other arrested but died of his wounds. Both Ahwaz and ISIS claimed responsibility for the attack. Shekarchi said terrorists involved were trained by the US (the CIA and/or special forces) and Israel’s Mossad in two Persian Gulf states, likely Saudi Arabia and the UAE if the report is accurate – both countries militantly hostile toward Iran, along with Washington and Israel. Ayatollah Seyyed Ali Khamenei called the criminal assault “the continuation of plots” hatched by Washington and their regional partners in high crimes, aiming to cause chaos and destabilize Iran. His senior advisor on international affairs Ali Akbar Velayati promised a strong response. Iran holds “regional terror sponsors” and their “US (and Israeli) masters” responsible for the attack. Ahead of parade day, the terrorists hid AK-47 assault rifles in a park along the parade route, said Shekarchi. The incident lasted about 10 minutes, attackers wearing military uniforms, according to reports. The event commemorated the anniversary of the Iran/Iraq war, beginning on September 22, 1980 – continuing until August 20, 1988. (The Carter administration allegedly backed it covertly. War continued throughout most of Reagan’s tenure, ending in stalemate, hundreds of thousands killed on both sides, countless others injured). Incidents like Saturday’s are well-planned in advance. The Trump, Netanyahu, and Saudi regimes were silent about it. come. Yemen’s Houthi Ansarullah movement denounced the “appalling” crime. Two important political statements were made ahead of the attacks. Iran, Russia, Syria and Hezbollah are its committed adversaries, wanting the scourge of terrorism combatted and eliminated.